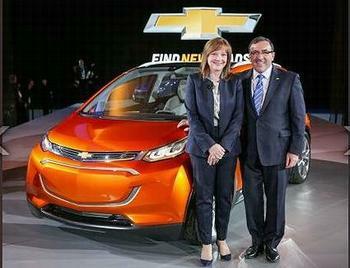 DETROIT, Michigan, January 14, 2015 (ENS) – Chevrolet unveiled the Bolt EV concept – a bright orange car that embodies the company’s vision for an affordable, long-range, all-electric vehicle – Monday at the North American International Auto Show in Detroit. The Bolt EV concept is designed to support DC fast charging and has a 200 mile range on a single battery charge. It will be offered in all 50 U.S. states and many global markets. In contrast to expensive electric cars such as the Tesla Model S, which sells for US$70,000, the Chevy Bolt will be priced starting at around $30,000. It will compete with the Nissan LEAF, which sells for around $28,000. The Bolt is not Chevrolet’s first all-electric car; that’s the four-door hatchback Spark EV. But Spark drivers complain that it takes a long time to recharge, even on a 240-volt charger; there is no telescoping steering wheel; it has a small backseat, and is only available in California and Oregon. The Bolt’s cousin, the plug-in hybrid Chevy Volt, runs on battery power with a small gas engine for backup. The first Volt, which hit the market in December 2010, had a range of 35 miles on battery power; the newest model, also unveiled at the Detroit Auto Show, has a 50-mile range on the battery before drivers must switch to petrol power. Chevrolet engineers have given the Bolt EV concept an entirely different look and feel. Bolt drivers can choose among operating modes designed for preferred driving styles, such as daily commuting or weekend cruising. The modes adjust accelerator pedal mapping, vehicle ride height and suspension tuning. The Bolt EV concept features a unique proportion, with practically no front or rear overhang. This configuration makes the most of interior space and is designed to create a roomy environment for four that feels expansive. Lightweight materials, including aluminum, magnesium, carbon fiber and woven mesh, complement the design and lower the curb weight to help maximize range. Vented rear fenders also help contribute to range. The Bolt EV concept’s interior uses glass all around and features a full-length, frosted glass roof with faceted design elements. A nano-composite rear hatch and wraparound rear window open the interior to natural light. Lightweight, slim-architecture seats are mounted on exposed aluminum pedestals, which the minimalist center console is suspended from the front seats. The concept Bolt EV’s Connect app is designed to allow ride-sharing management, including reservations, vehicle location, digital key and payment processing via smartphone. The Bolt EV features automatic park-and-retrieval technology. The driver can leave the vehicle and tell the Bolt EV concept to park itself. When errands are completed, the Bolt EV concept can be summoned to return to the owner’s location. A large, color 10-inch-diagonal capacitive-touch screen, with interface features, complements the concept Bolt EV Connect app. It allows the projection of all the application and other smartphone data onto the screen. More than 500 vehicles are on display at the North American International Auto Show at Detroit’s Cobo Center. The show opens to the public on Saturday, January 17 and will be open through Sunday, January 25.